From Rana Plaza to Radical Transparency — Anna Akbari, Ph.D.
Before April 24th, many of us didn’t know that Bangladesh follows China as the second leading garment exporter in the world, with over 5,000 factories, 4.5 million employees, and the lowest wages anywhere, coming in around $37 a month. The tragedy late last month at a garment factory building in Rana Plaza, which killed over 1,100 people, caught consumers’ attention, as well as 31 of of the world’s major retailers, who recently agreed to sign a breakthrough fire and safety plan. 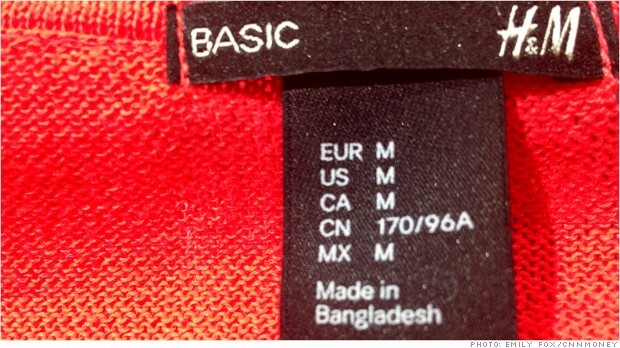 After H&M, the largest buyer from Bangladesh, endorsed the accord, European labels Zara, Primark, C&A, and Tesco followed suit. Despite online petitions with over a million signatures, only two US retailers are among the companies on board in Bangladesh: Abercrombie & Fitch and PVH, the owners of Calvin Klein, Tommy Hilfiger, and Izod. Wal-mart, the largest retailer in the world, and Gap (including Banana Republic and Old Navy), are notably missing from the pledge, and could have contributed to the lack of US-based support. Regardless, the news from Bangladesh has caused Nordstroms to consider going public with their practices, and The Sustainable Apparel Coalition, which has already enlisted some of America’s major players, will be making a big push for its fall debut of new social and labor measurements. Bruno Peiters calls Honest by the world’s first 100% transparent company, offering a full breakdown of its limited edition products, including how many employees and hours it takes to cut and iron a garment, the price of raw materials, transportation costs, store markup calculations, and each piece’s carbon footprint. Pieters dreamed about such a company while on sabbatical from fashion in India when he realized that many locals wore clothing from identifiable sources and sewers. In order to stand by its 100% transparency policy, Honest by conducts extensive research into the origins of its raw materials and the working conditions of its manufacturers, and forgoes anything made or even trimmed with leather goods, fur, shell or horn. Like Honest by, Everlane has practiced radical transparency since its inception, revealing each piece’s actual costs and their markup. After its first year, the San Francisco-based site had enlisted over 600,000 users, and the numbers are only growing – fueled by slogans like “Know your factories. Know your costs. 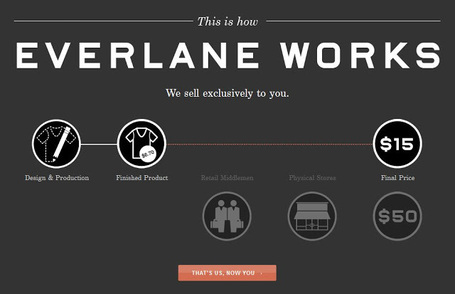 Always ask why.” By existing online and eliminating overhead costs, Everlane’s prices are able to match its minimalist aesthetic, with luxury t-shirts starting at just $15. New York-based startup SumAll is known not only for its radical transparency, but also for its success. Revealing everyone’s salaries and the company’s complete capital structure requires a lot of collaboration and explanation, but in the end, CEO Dane Atkinson thinks it saves time and produces loyal, engaged analysts who would turn down jobs at Google. The company tracks sales trends and helps small businesses and nonprofits collect, analyze and present data in order to better meet goals, especially if the goals relate to global issues. Last year, every employee agreed to sell a total of $500,000 worth of shares in order to form their own foundation called SumAll.org, and their first project, not surprisingly, visualized new findings about slave labor. Want more ethically-produced products? Check out our picks here.